With the discovery of radioactivity about a century ago, uniformitarian scientists have assumed they have a reliable and quantitative means for measuring absolute time on scales of billions of years. This is because a number of unstable isotopes exist with half-lives in the billions of year range. Confidence in these methods has been very high for several reasons. The nuclear energy levels involved in radioactive decay are so much greater than the electronic energy levels associated with ordinary temperature, pressure, and chemistry that variations in the latter can have negligible effects on the former. Furthermore, it has been assumed that the laws of nature are time invariant and that the decay rates we measure today have been constant since the beginning of the cosmos — a view, of course, dictated by materialist and uniformitarian belief. The confidence in radiometric methods among materialist scientists has been so absolute that all other methods for estimating the age of geological materials and geological events have been relegated to an inferior status and deemed unreliable when they disagree with radiometric techniques. Most people, therefore, including most scientists, are not aware of the systematic and glaring conflict between radiometric methods and non-radiometric methods for dating or constraining the age of geological events. Yet this conflict is so stark and so consistent that there is more than sufficient reason in my opinion to aggressively challenge the validity of radiometric methods. One clear example of this conflict concerns the retention of helium produced by nuclear decay of uranium in small zircon crystals commonly found in granite. Uranium tends to selectively concentrate in zircons in a solidifying magma because the large spaces in the zircon crystal lattice more readily accommodate the large uranium ions. Uranium is unstable and eventually transforms through a chain of nuclear decay steps into lead. In the process, eight atoms of helium are produced for every initial atom of U-238. But helium is a very small atom and is also a noble gas with little tendency to react chemically with other species. Helium therefore tends to migrate readily through a crystal lattice. The conflict for radiometric methods is that zircons in Precambrian granite display huge helium concentrations.1 When the amounts of uranium, lead, and helium are determined experimentally, one finds amounts of lead and uranium consistent with more than a billion years of nuclear decay at presently measured rates. Amazingly, most of the radiogenic helium from this decay process is also still present within these crystals that are typically only a few micrometers across. 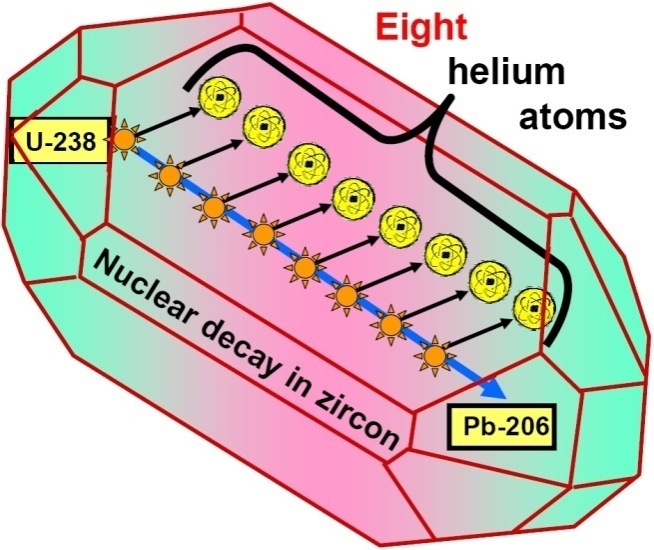 However, based on experimentally measured helium diffusion rates, the zircon helium content implies a time span of only a few thousand years since the majority of the nuclear decay occurred. The RATE team professionally measured the helium ‘leak’ (diffusion) rate of helium out of zircon crystals. Using that rate and comparing the large amounts of helium still within the crystals put the estimated age of these zircons at 5,600 years +- 2,000 … far from the 1 billion + year age. It is simply impossible that this much helium could be retained within these crystals for hundreds of millions of years, and this and many other important discoveries of the RATE project (like Polonium radiohalos and fission tracks) points to the conclusion that the rate of nuclear decay was at some point exponentially higher (if even for a short time). During that time most of the helium and lead would likely have been produced. The RATE team postulates that this may have occurred during creation week and during the flood. So which physical process is more trustworthy — the diffusion of a noble gas in a crystalline lattice or the radioactive decay of an unstable isotope? Both processes can be investigated today in great detail in the laboratory. Both the rate of helium diffusion in a given crystalline lattice and the rate decay of uranium to lead can be determined with high degrees of precision. But these two physical processes yield wildly disparate estimates for the age of the same granite rock. Where is the logical or procedural error? The most reasonable conclusion in my view is that it lies in the step of extrapolating as constant presently measured rates of nuclear decay into the remote past. If this is the error, then radiometric methods based on presently measured rates simply do not and cannot provide correct estimates for geologic age. 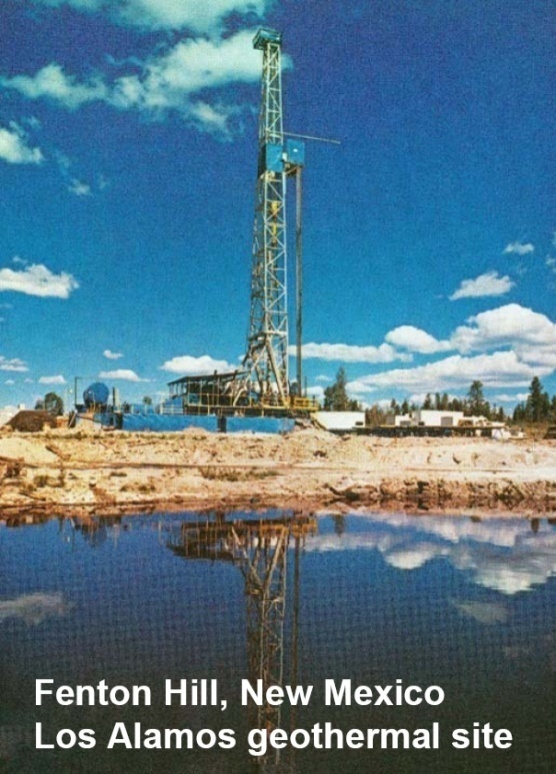 Pictured is the bore hole from which the granitic rocks were obtained, which contain the microscopic zircons. These rocks are dated by their position in the rock record as Pre-Cambrian, and their uranium-lead age as interpreted by evolutionists is 1.5 billion years. This implies that when these rocks formed, no multicellular forms of life such as trilobites and fish were in existence on the planet (such life forms do not appear in the rock record until what is called the ‘Cambrian Explosion’). However, by dating these rocks according to the rate at which helium produced from uranium decay escapes from zircon crystals, one gets a time span of only about 6,000 years since these rocks were formed. But just how strong is the case that radiometric methods are indeed so incorrect? There are dozens of physical processes which, like helium diffusion, yield age estimates orders of magnitude smaller than the radiometric techniques. Many of these are geological or geophysical in nature and are therefore subject to the question of whether presently observed rates can legitimately be extrapolated into the indefinite past. we infer time estimates drastically at odds with the radiometric time scale.2 These time estimates are further reduced dramatically if we do not make the uniformitarian assumption but account for the global catastrophism described earlier. There are other processes which are not as easy to express in quantitative terms, such as the degradation of protein in a geological environment, that also point to a much shorter time scale for the geological record. It is now well established that unmineralized dinosaur bone still containing recognizable bone protein exists in many locations around the world.3 From my own first hand experience with such material, it is inconceivable that bone containing such well preserved protein could possibly have survived for more than a few thousand years in the geological settings in which they are found. These photos are of a later (2005) find by Schweitzer which produced soft tissue from a T. rex, in addition to strengthening the red blood cell identification. Images originally published in Science 307 (March 25, 2005) pp. 1952-1955. I therefore believe the case is strong from a scientific standpoint to reject radiometric methods as a valid means for dating geological materials. What then can be used in their place? As I Christian, of course, I am persuaded the Bible is a reliable source of information. The Bible speaks of a worldwide cataclysm in the Genesis Flood which destroyed all air breathing life on the planet apart from the animals and humans God preserved alive in the Ark. The correspondence between the global catastrophe in the geological record and the Flood described in Genesis is much too obvious for me not to conclude that these events must be one and the same. With this crucial linkage between the biblical record and the geological record, a straightforward reading of the earlier chapters of Genesis is a next logical step. The conclusion is that the creation of the cosmos, the earth, plants, animals, as well as man and woman by God took place just as it is described only a few thousand years ago with no need for qualification or apology.